If there's anything JCB do well its unique agriculture machinery, and there's nothing more unusual than their Fastrac series. Simply put, its a high speed tractor for driving on the road with a load of horsepower to pull along trailers and implements when working on the field. 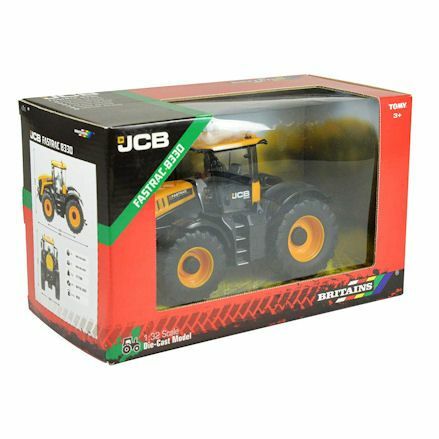 If you're in need of an original, but fitting die-cast tractor, than a JCB Fastrac toy tractor is the one for you. They're equipped just like a conventional toy tractor with big tread wheels, rear hitch for towing, an optional front loader and a front attachment feature. Before investing in a new toy Fastrac lets take a look at its main selling points and features before you decide on a JCB Fastrac or the safe John Deere or similar names. Why not treat them to a JCB Fastrac toy with a fully functional front loader. That's right, there's no need for a stand-alone model when add-ons are available. In this case a working front loader will do just the job, and can be removed anytime, but if you know the child like we do - it will almost stay attached. Take Bruder Fastrac, you could buy a model without the front loader, or for a few extra quid, why not go for the Fastrac with front loader. And well you can choose to remove front loaders from big toy Fastracs, this isn't really so in Britains and Siku models - in any scale. 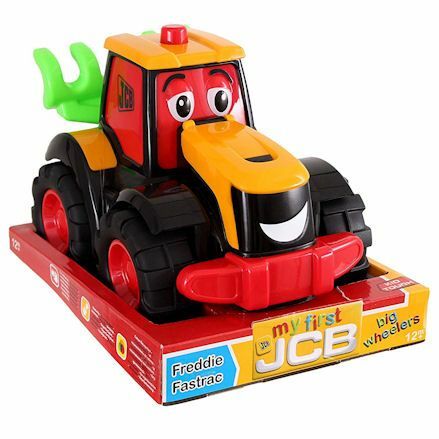 The job of the toy front loader is simple; it has an up and down motion, well the child uses a lever or manually controls the bucket to pivot and grab at objects. Further down the page we go into detail with a stand-alone Bruder Fastrac without the front loader, and if this is more your thing, then skip ahead. But here is a highly playable, fully functional Bruder Fastrac with a working front loader that moves up and down, with a grabber for picking up bales and all sorts of farm items. Pull, push and gab the lever to make the front loader do all types of movement, depending on your needs. Though you'll likely be spending time picking up large heavy bales and loading them up in piles or onto an awaiting trailer. Like any tractor working on the farm, they need to tow heavy trailers for hauling crops to ploughing the fields. And it isn't any different with Fastrac toys either. Take the Siku series as they have a few Fastracs that come with toy farm trailers, its just a matter of picking the model that comes with the trailer you like most. You're not limited to tractor trailer models mind you, you could go out and a pick up any stand-alone model and choose to include any farm trailer or implement later. Take Britains and Siku for example, they have a huge collection of farm implements in each of the respective ranges, so you're free to pick up a trailer or implement the child is crying out for most. 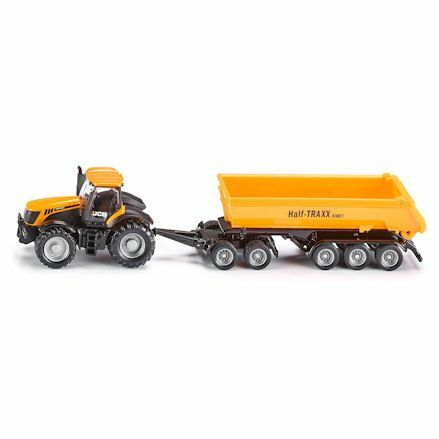 As it stands, there is no Britains Fastrac for towing Big Farm trailers, though you're fully covered with their 1:32 series. Here is a perfect example of a Siku JCB Fastrac with a tipping trailer, only a dolly acts as the link between the tractor and trailer. In which case similar size scale trailers can be attached to the dolly so the Fastrac can tow it with ease. Mind you this is not a familiar sight with Fastrac toys that comes with trailers, normally you could attach a trailer the regular way - by directly attaching to the rear hitch - with no dolly in the way. As usual, this Siku model is compatible with all trailers and implements in 1:87 scale. A medium size Fastrac is largely available in 1:32 scale with die-cast JCB Fastrac toy mostly available from Britains, and a job well done too. 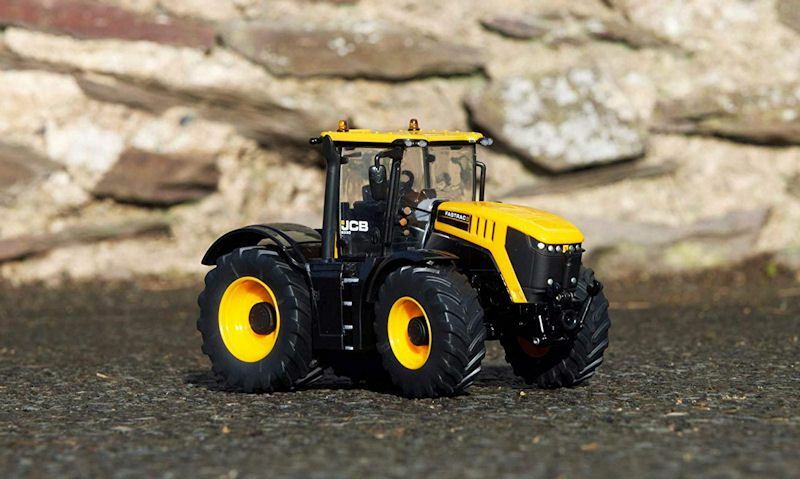 Britains JCB Fastrac replicas are made very well in a solid die-cast metal. They feature free-rolling wheels, removable cabin, bouncy suspension with front and rear steering and a rear trailer hitch. Well Britains stay on top of Fastrac's in their series, also look to Siku Farmer range in 1:32 scale. Like we've explained above, they can be purchased with or without trailers. Because this scale is much smaller, functionality will become limited, and well doors can't be opened, the rear hitch works with all types of implements. 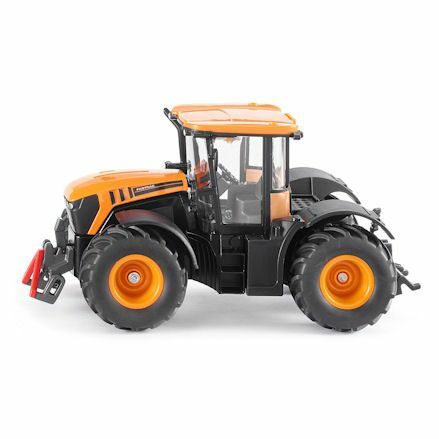 Beast of a diecast model this one, and since 2015 this Britains Fastrac has been available for sale in the current range. At 18cm in length, its a little bigger then conventional 1:32 scale models. And so it should be as it means its able to tow the largest of farm implements. As you can imagine, the trailer will attach to the rear hitch with ease, and unlike other Britains tractor models, the hitch is more accessible due to the way these JCB tractors are designed. Remarkably, this model was released three years after the one we've mentioned above, but is this one really an improvement we ask? In our opinion, it is not. 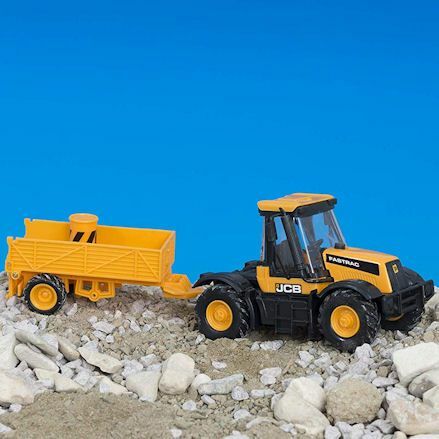 Britains job is to release a new model based on real life machines, released by JCB, so its only natural for Britains to stay on topic, by releasing the scale version also. We wouldn't say its as attractive as the previous release - though you might disagree - but its still a little compact, and capable of towing big, heavy trailer loads. We think you'd have to agree, but this version of a JCB Fastrac must be one of the most impressive in the series, and Siku just may have beat Britains to the punch here. Only this model was released in between the Britains releases mentioned, so in fairness to Britains, Siku decided to release this one well Britains left it alone. But isn't it an amazing looking toy; big and bulky in the driver's cabin, it also appears to be higher up, which is useful for working on the fields. As usual, this model will tow all Siku's farm implements and trailers in 1:32 scale. We couldn't wait until the end of the year to show you what Britains have up there sleeve for 2019, and waiting for you is this beautiful machine that will put others to shame. We don't no enough about it as this time, but expect it to be fully compatible with the current 1:32 scale series. Only there's more, it just may be compatible with Britains tractor drivers, as Britains have mentioned - all releases from now on will be compatible with driving figures. For now just admire the box it comes in, as it is presented a little differently then before. 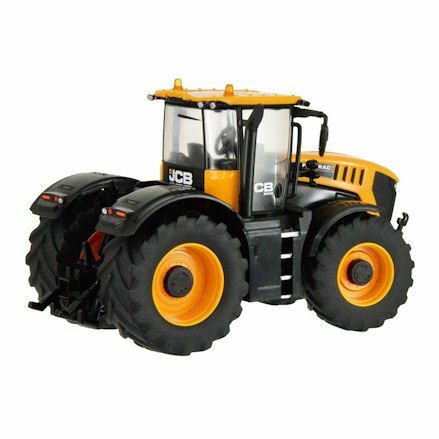 Normally, we would look at both Bruder and Britains Big Farm models to seek out big toys in 1:16 scale, only this time the Big Farm series has let us down. 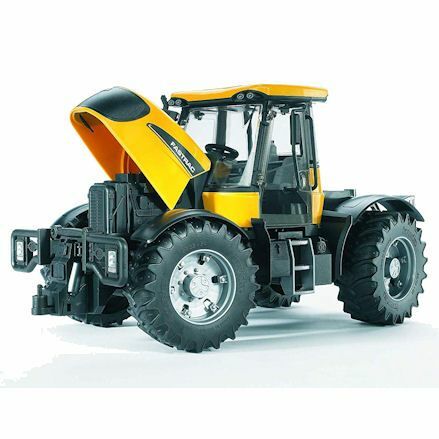 So here we're just looking at Bruder Fastrac's as other brands are not available. 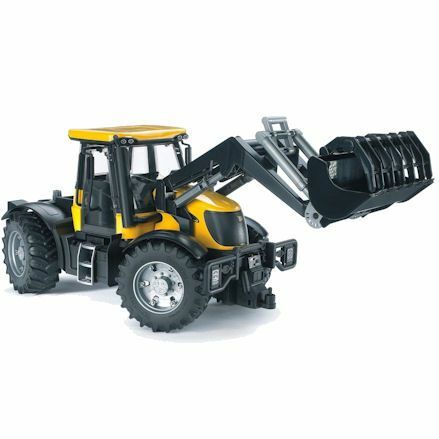 In big scale, large JCB Fastrac models you'll benefit greatly as they tend to feature a lot more detail with functioning parts - which is restrictive on a small scale model. In the driver's cabin you can open doors, the rear hitch is easier to play with and the wheels turn - and there's the option to fix a front loader with ease. With Bruder, you have a choice of dozens of implements to tow, loaders to attach and additional accessories to improve play value. You can do one of many things with this stand-alone Bruder Fastrac. Play with it has it is which should provide all the fun they will need, add a functional front loader with attachments - or add a trailer to improve value in the tractor. If we had to choose one, we highly recommend adding a Bruder trailer for towing, there's lots of fun to be had hauling stones, rocks and all sorts of items found outside. Expect this model to have opening driver's cabin doors, steering using the driving rod that pops out from the rear with steering from the front and back wheels. There's an option to add a counter-weight to the front too. 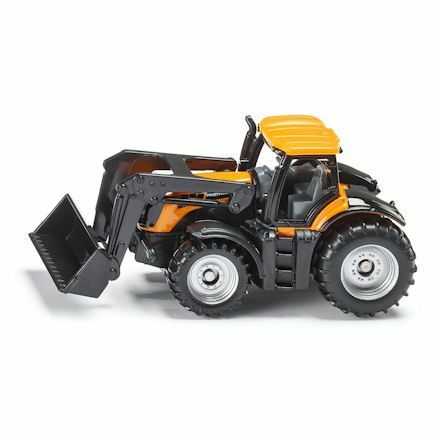 Finally, when you're in need of a miniature tractor - in the line of matchbox cars - then look to Siku farm toys with their HO scale die-cast JCB Fastrac. They're small models but still pack plenty of features with detailed exterior and interior decor. The design of the miniature models can still be distinguished as a Fastrac, and come as stand-alone models, or with trailers and front loaders - or both. They can be quite pricey, but this is Siku 1:87 models after all, and its tough to grab hold of models in the same scale from similar brands - so its just a matter of making do. 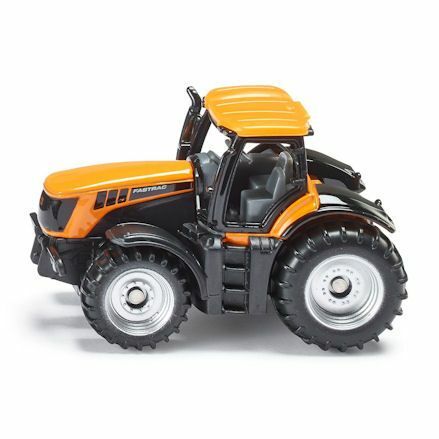 You'd think there's not alot to say about a miniature scale Fastrac like this one, but as its only one of a few models currently available, we have plenty to say. And well there's a front loader already attached to this model, there's extra fun to be had right there. Siku also have a helping hand of farm implements in 1:87 scale, and they are all compatible with this model. Apart from the front loader, there're not many functioning parts, perhaps with just the free-rolling wheels and hitch. 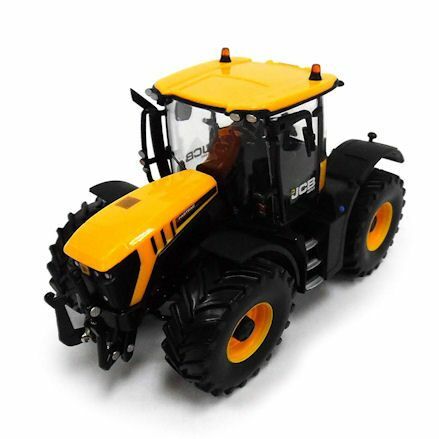 After miniature JCB Fastrac toys in 1:87 scale, comes all sorts of models we simply class as small, and again Siku have you covered here with their Siku Super series. What this entails is, the series is not really modeled on scale, only they're small but will fit in with each other perfectly, and are fully compatible. Its also worth noting, its estimated that they do come in at 1:72 scale, so in theory are slightly larger models than Siku's 1:87 scale series. They don't come in boxes but they are sold in packaging known as blister. What we do have for you is one Siku model for you, and if any more are released in the series, will be sure to include it right here. Technically speaking, this is suppose to be a cheaper version to the rest of the Siku series, but in case of this model, it is expensive. There's not much to offer with this JCB Fastrac, only to say it has the usual free-rolling wheels and a rear hitch that works with all types of trailers and implements. As there's no front loader that's attached already to the model, which means there's no way you can add one later - it doesn't offer this option. So its important to consider using this tractor in conjunction with a matching trailer to get hold of its full value. Though we do understand if you just love this model as it is. We bet you didn't know there's the option of a Fastrac ride on tractor did you, well there is, but is suitable mostly for toddlers. Usually ride on tractors are modeled on John Deere or New Holland, but not here as we finally have a replica Fastrac for kids to sit on and ride. You can expect a comfy seat with some sort of back support (if that), and working horn and it should be light enough for even the youngest to ride it. And here is, HTi's go at one of a few foot-to-floor ride on tractors available. As its a scoot along tractor, this means its aimed at toddlers, from 12 months to 2 years, with the option of taller, older kids to have a go. Play with it on the patio, on the lawn or in the sand, its made to last with tough, durable plastic. The steering wheel controls the front wheels, the seat can be lifted up to store all sorts of things in there, and has a functional horn. 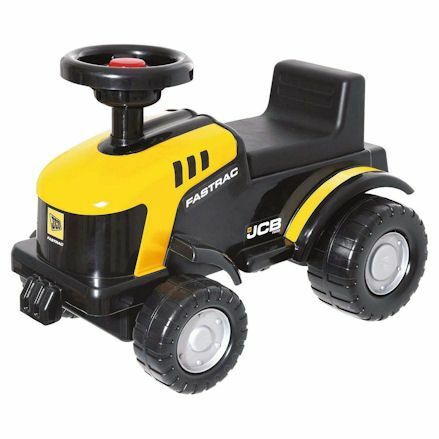 What you should expect to find with Fastrac toys for toddlers is just that, childish, chunky and safe toys from age 12 months and up. So away with the replica design and the fine detail, designers have been a little creative here with rounded off corners, with happy faces fixed to the windows. This is not true for all tractors for toddlers, but that's the sort of things you'll get with toddler toy vehicles, and its no different with JCB Fastrac. 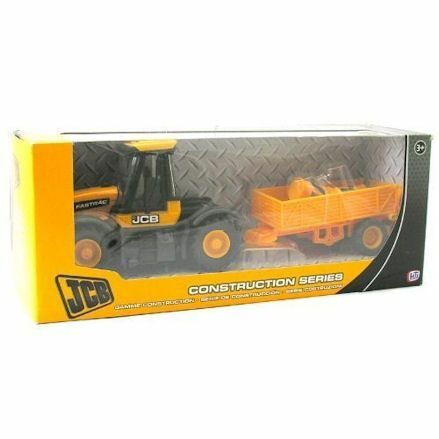 In fact here in the UK JCB do take up most of the market in toddlers construction toys, so it shouldn't be any different here. Either way, you will be in safe hands with a child-safe toy. Big, chunky made for toddlers Fastrac boost free rolling wheels, a removable rake that folds down in the rear (also known as a plough). Here they've made sure its labeled kid tough, and will withstand bumps and scrapes out in the garden or in the sand box. This is not an electronic toy so can get wet. It will appeal to toddlers thanks to the happy face over the driver's cabin and a smiling mouth where the engine radiator would be. Talking about the engine, access to the engine compartment is under the lift-up bonnet, where they can inspect the detail. So far we have only really talked about brands that can be expensive to buy. But this is for good reason, well-known up market brands are respected enough to allow JCB to issue a license to make toys of their machines. Lesser known brands, or brands known to make cheaper toys find it harder to get a license. But because they are cheaper to buy; and don't get us wrong, they can look poorly made, there can also be high quality - cheap to buy - JCB Fastrac toys to be had. Compare this model to brands that make finer models, and the difference is obvious, but what you have here is Fastrac still to scale with a trailer and accessories. 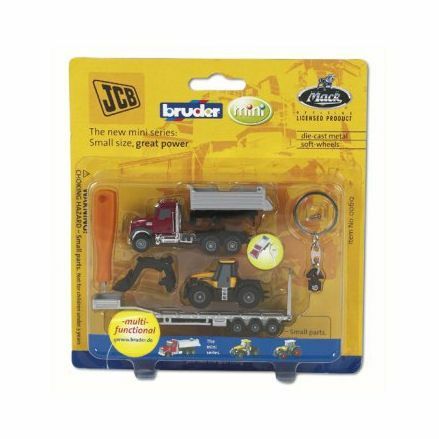 This cheaper toy boost free-rolling wheels on both the tractor and trailer, a little suspension and a detailed driver's cabin. There's the option to drive the Fastrac with or without the trailer, and if you like will fit in with Siku or Britains farm toys nicely. Though be aware, they will probably not be compatible with one another. As you may of guessed by now, HTi lead the way in cheaper Fastrac toys. But they've done it well again here with this replica model with a simple trailer that attaches to the rear hitch, and can also be removed. This model is pretty much the same as the one above, only the here you might just get a model you didn't want. So be sure to get in touch with the seller before ordering, you don't want to end up with a digger when you really wanted a Fastrac. Its taken a while to seek at all types of Fastrac toys available to buy online, and what we did find is a set of keyrings with the JCB included. Its not all about the Fastrac mind you, these sets can include other farm and construction vehicles with trailers and even a front loader. And well they might not be used as a keyring by the child (very unlikely) what they're going to do is want to play with it. They can do just that as they are tractor toys first, keyrings second, and Bruder have made sure they fit in nicely and have lots of functional parts. Take away all the stuff that relates to the keyring side of things, and this set has a lot to offer. There's a long MACK truck with a detachable, tipping action, and of course the tiny Fastrac, with the option to add on the front loader. Likewise, you can also attach the long low loader trailer to the hitch of the tractor or truck, with the option to tow the MACK truck on the trailer. All in all, the keyring can be setup to fix to the trailer, tractor or truck. 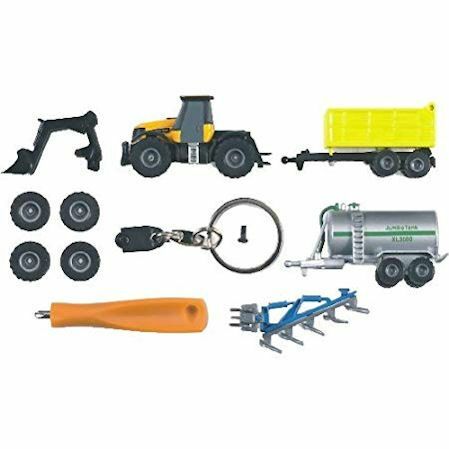 Back to the subject of tractors, here is a keyring set focused on the JCB Fastrac only, with additional accessories and trailers. And its not for show either, all the accessories and trailers here are made to work with the JCB. Take the, tanker, plough and farm trailer, each one can be towed using the rear hitch of the JCB Fastrac, well the front loader can be fixed to the front. And when the wheels are worn, its time to change the tyres with the spares.